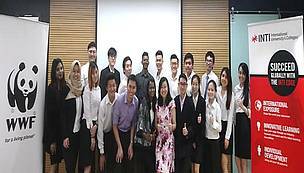 The students with (front row, from fifth from left) Mr SC Ooi from WWF-Malaysia, Ms Uma Muthusamy, Ms Suan Tan and Mr Clement Choe. With the support of Mr Kevin Lowrence, Dean of INTI International College Subang’s Center for American Education (CAE), as well as Ms Naomi Yang and Mr Clement Choe of the Career Services department, lecturer Ms Uma Muthusamy guided her Biodiversity and Environmental Issues students to achieve a highly successful project, overcoming significant time, manpower and logistics challenges. WWF-Malaysia extends our heartfelt thanks to them for their triumphant completion of the ‘Save Our Turtles’ Employer Project, aimed at enabling youths to build support and raise funds for WWF-Malaysia’s conservation efforts. Even though they are yet to graduate, the students – with expert and nurturing guidance from their lecturer Ms Uma Muthusamy – were able to develop real world skills to bring real positive impact for conservation. 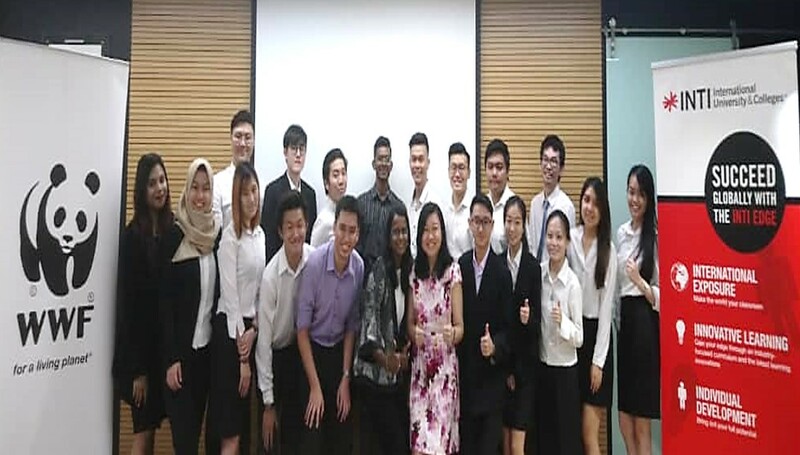 The students took the initiative and boldly accepted the challenge to build support and fundraise for WWF-Malaysia even though the short semester allowed them only two weeks to execute their activities and they were a small group of 16. Despite the constraints, the students poured their passion into the project, demonstrating commendable communications skills, teamwork, creativity, solutions oriented thinking and entrepreneurial spirit. The students diligently checked with no less than 10 T-shirt suppliers before finding a cost effective one able to deliver the T-shirts in the short time frame. They took the initiative to move their booth twice so they could find a spot with the highest human traffic. Because the campus is undergoing renovations, renting booth space to vendors was not an option for them, but they creatively charged a nominal sum for seats on the bus to the Melaka Hawksbill Turtle Sanctuary, thereby raising even more funds for turtle conservation while sharing the important environmental protection message. The project ended with an educational visit to the Melaka Hawksbill Turtle Sanctuary, where many students saw live turtles for the first time. After a turtle conservation presentation by Department of Fisheries officials, Ms Uma Muthusamy and her students braved the hot sun to participate in a beach cleanup, where they all demonstrated a positive attitude, diligence, teamwork and camaraderie. “Embarking on this Employer Project with WWF Malaysia in a short semester was not an easy task. However, through the collaborative efforts and cooperation by CAE, WWF-Malaysia, Department of Fisheries, Melaka and of course my dear students of SCI219S and NSC4050, this project was carried out successfully and the students were able to achieve the intended objectives. I truly believe this project has greatly benefited our INTI students in exposing them to philanthropic acts and creating greater awareness of the importance of the environment and its rich biodiversity,” shared Uma Muthusamy. “I deeply thank and have the utmost admiration for the students and Ms Uma for taking on an Employer Project during a short semester, and applaud them for over delivering on their target of RM4000 – they raised RM5545 for conservation – despite significant challenges. The Employer Projects are designed to empower students with real world skills so they have the edge when they graduate, but the students themselves have to take the initiative to get the most out of the project. In this case, the students have performed well above expectations, and I believe they personify the incredible and inspiring qualities that WWF-Malaysia has come to associate with INTI,” said Ms Suan Tan, Brand Activation Senior Manager of WWF-Malaysia, during the well-prepared, polished and eloquent final presentation by the students at WWF-Malaysia’s PJCC Head Office. Please download the final presentation slides from the column on the right.